A list of fun play dough tools that can make play dough even more exciting. These are things you probably already have in your kitchen or craft drawer. Play dough is a great summer time boredom buster or rainy day activity. Play dough is fun, but the best part is that it is a great educational tool for kids without them even knowing it. Playing with play dough helps develop small muscle control, hand-eye coordination and strengthens the muscles in your child’s fingers, hands and wrists, which is important for helping them learn how to write and use scissors. These are important things, but play dough doesn’t stop there! Play dough can also teach your child imagination, creativity, problem solving, self-expression and communication. Play dough is amazing stuff! 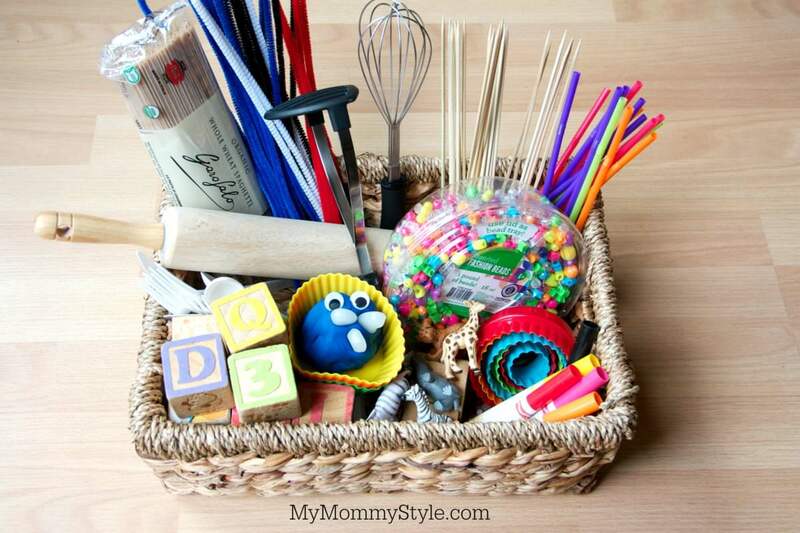 I love to offer a few tools for my kids to use while playing with their play dough. The tools can add to the sensory aspect of the play or they can help the children with their creativity. Mostly, they add another level of fun. There are many products you can buy, and they are great, but you probably already have a lot of play dough tools at home. Here is a list of our very favorites. 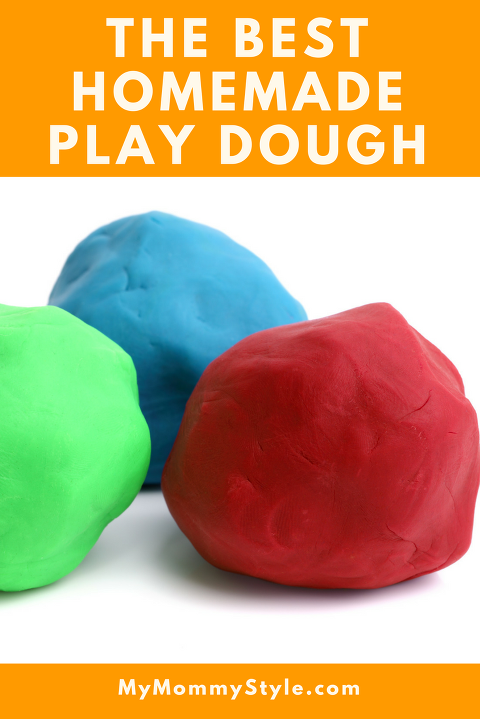 To add to the fun take the time to make your own play dough with your kids. Kids love helping out in the kitchen and this play dough is perfect. I prefer plastic flatware, especially if they are using knives, but whatever you have in your drawers at home works great. 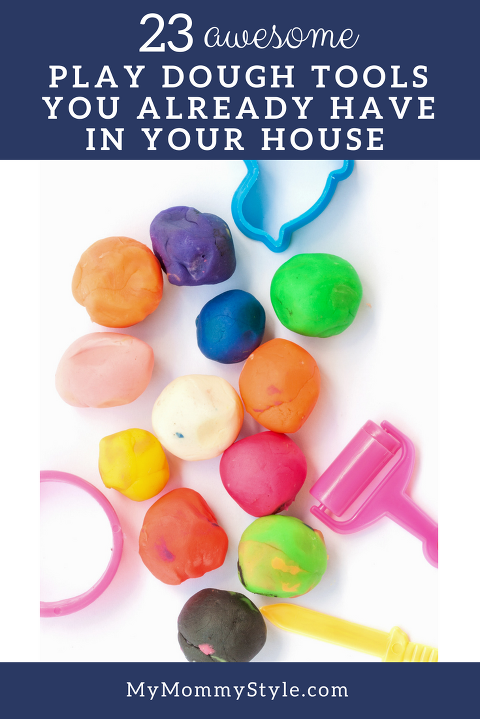 Play dough is easy to clean, so don’t worry too much about the mess! (I know that can be hard sometimes.) Forks are great for poking, spoons can be a great mold or stamp, and knives are great for carving. These fuzzy bendable sticks can be anything your kids can think of, a smile on a face, crazy hair, or flower stems (to name a few). I’ve seen my kids combine play dough and sticks to make some pretty impressive houses and buildings. This is by far my kids’ favorite play dough tool. If your kids are looking to make some hair for a new creature a garlic press is perfect. There is something so satisfying about smashing a potato masher into the play dough and watching the dough smoosh out the top. Its a fun stamp with great texture. Any stamps you have at home can be used in play dough. We usually don’t use ink, but it would be fun to experiment with stamps and ink on the play dough. Whisks are another fun stamp with great texture. Make a play dough monster or friend! They can add conversation and imagination, but they are also fun for stamping. Of course! I think cookie cutters are the first thing most people think of when they think of play dough tools. These are great for hand-eye coordination and for learning shapes. These are great if you don’t happen to have any cookie cutters. I like wooden skewers a lot better than toothpicks because my kids always want to stick toothpicks in their mouths and it freaks me out! Wooden skewers are longer so they aren’t the choking hazard that toothpicks are. These are great for writing in the play dough, which is great handwriting practice! I added these because they can be found anywhere and cost absolutely nothing. My boys love using rocks! Buttons add texture to the play dough and can be used for many different things. It’s fun to watch and see what your child comes up with! Cutting play dough is great scissor practice! These are another fun stamp that’s just a little different than skewers. You don’t normally think about writing on play dough, but it is a lot of fun. If you make your own play dough skip the part where you color it with food coloring so you start with white play dough and then let your kids draw on it and experiment with colors. Milk lids can also be used as a cookie cutter or a cool detail item. Milk lids make great wheels for a play dough car. These are great if you want to make play dough cupcakes, but they have other uses. You can use them to hold beads, googly eyes, or other small tools you are using. My kids love to make play dough food and these silicon liners are great bowls or holders for food. Beads have many uses. They are fun to press into the play dough and they can be used for small details like eyes, spots on an animal or sprinkles on a play dough cupcake. These are just a few play dough tools you may already have sitting around. Look around your house and I’m sure you can come up with even more. For more fun from My Mommy Style like us on Facebook, follow our YouTube Channel, and watch our day to day happenings on Pinterest and Instagram!